Hyenas are one of the most common and successful predators that you will see while on safari in the Savuti region of Botswana. 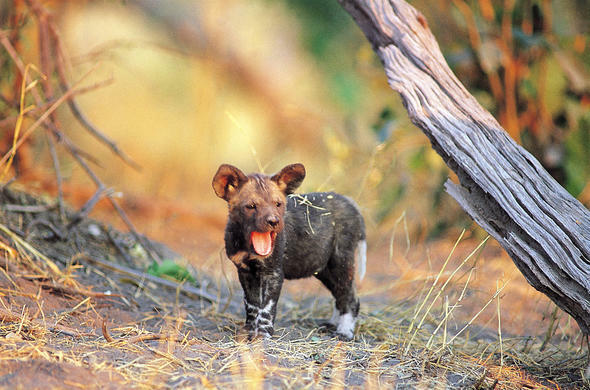 The Savuti region is known for the number of predators that live in the area, in particular Lions and Spotted Hyenas. These animals are one of Africa's most numerous and successful predators. They have acquired a reputation of being low and cowardly, however, they are highly intelligent animals that have a complex hierarchical society. They occur in groups called clans which are led by a dominant female. 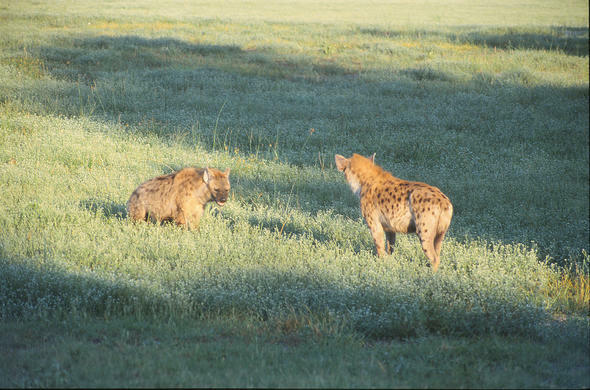 Male Hyenas are normally submissive to the females. 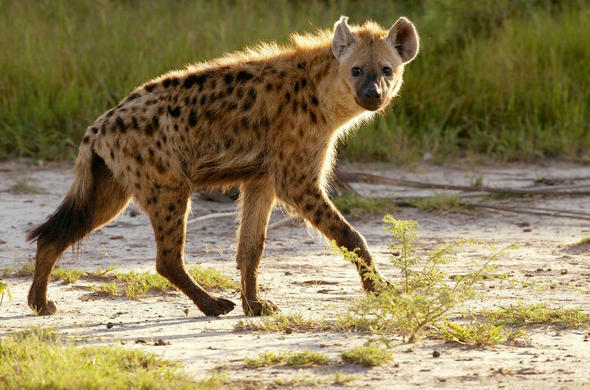 Hyenas feature prominently in African folktales and are often weirdly associated with both immorality and cowardice depending on which culture the belief comes from. They are mostly active at dusk and at night when it is cooler and easier to hunt. Their maniacal laughs and whooping cries are one of the most eerie sounds of the African night. 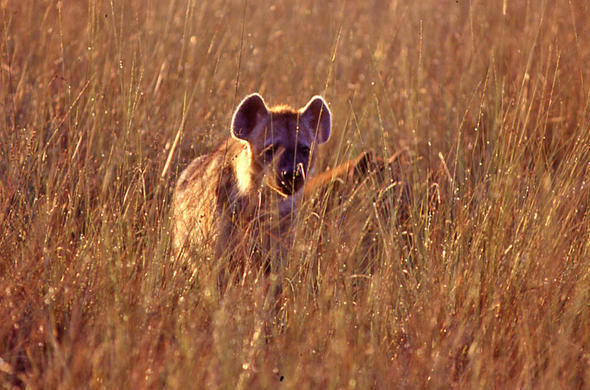 Hyenas usually take over Warthogs burrows and many members of the clan may share it, especially if there are cubs. In the 1980s there were 5 clans that lived in the area with about 39 clan members each. These clans generally feed on low density resident game such as Impala and Warthogs, but will also feed on the newborns of the migrating herds - especially during the annual Zebra migration. They are opportunistic feeders and are known for their powerful jaws and cast iron digestive system, eating their way through canned food and pots raided from campsites. They scavenge just about anything and regularly finish off the kills of other predators. They have been known to eat fruit and the faeces of other animals. 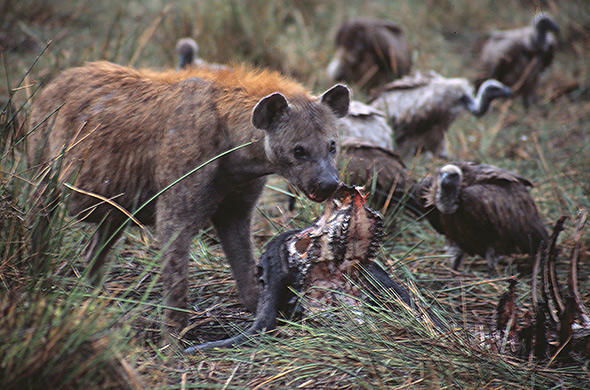 Hyenas and Lion compete over food resources and this often leads to a bitter conflict between these two species. 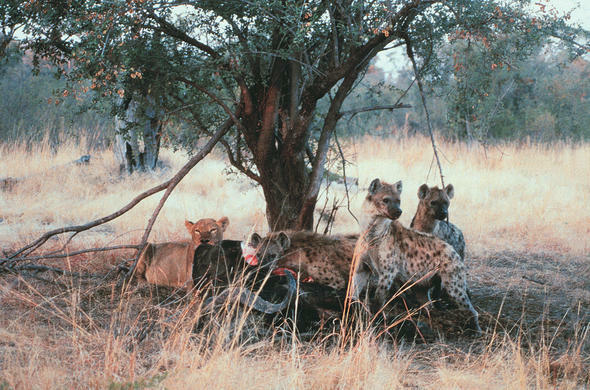 The rivalry between the Savuti Lions and Hyenas was filmed in the 1960s by Dereck and Beverly Joubert. This film shows how the Lions and Hyenas literally go to war over the scarce food resources in the area. 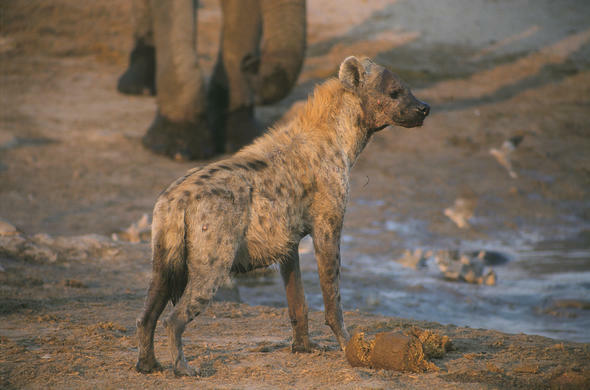 In fact Hyenas are very efficient predators and often it was the Lions that were stealing the Hyenas kills. Hyenas instinctively fear Lions but will take them on, and Lions have been known to kill Hyena cubs. Lions generally ignore Hyenas except when trying to take their kill of them. Though sometimes they may feed alongside each other and if they have enough numbers, they may even force Lions off a kill. Hyenas are very efficient hunters and will even take to the water in pursuit of their prey, though they avoid water with Crocodiles in it. They are opportunistic feeders and will often steal prey off Cheetah and even occasionally Leopards. Spotted Hyenas can breed at any time of the year though most give birth during the wet season when their prey is giving birth and there is lots of easy prey available. They usually give birth to two cubs at a time. The dominant female usually gives birth to the female that will become her successor as this is determined by size and aggressive behaviour. During pregnancy the mother produces extra androgen which will cause the cub to be large in size and aggressive in nature. The matriarch's cubs will automatically outrank the other cubs and members of the clan.